What Causes Southern Magnolia Leaves to Turn Yellow? Have you noticed yellow leaves on your Southern magnolia (Magnolia grandiflora)? If your balled-and-burlapped specimen has sparse flowering and yellow leaves dropping off of the tree, read on to troubleshoot the potential causes. First of all, you need to rule out a nutrient deficiency in your soil. Yellow leaves on Southern magnolias can indicate that your soil has insufficient nitrogen. The only way to determine for sure whether or not this is the problem is to have a soil test done. If the test results do, in fact, show a nitrogen deficiency, you can fertilize accordingly to raise the nitrogen level. The nitrogen content of fertilizer is indicated by the first number in the NPK sequence, which should be printed somewhere on the fertilizer bag. Let's assume that you have had a soil test done and have been able to rule out nitrogen deficiency. What else could be the problem? Sometimes, when Southern magnolia trees develop yellow leaves (often accompanied by the presence of spots), it is only as a prelude to natural shedding (which happens periodically). However, this seems to occur more often in the spring. If you see the yellow leaves in fall, there could perhaps be a problem with your Southern magnolia in terms of water and/or drainage. Let's expand on that observation. Too much or too little water are both possibilities, whether you irrigate yourself and/or rely on rainfall. But the issue of water is inextricably intertwined with that of drainage. Why? Because even if there is sufficient water, if it percolates through the ground too rapidly, the Southern magnolia tree would not be able to take full advantage of it. Conversely, if the drainage is impeded by an overly clayey soil, and you get a lot of rain and/or overwater your specimen, the roots will "drown." Either extreme is bad news. If you think drainage is an issue, you may want to transplant your tree to another area, after first preparing the soil for optimal drainage. A loamy soil is ideal. 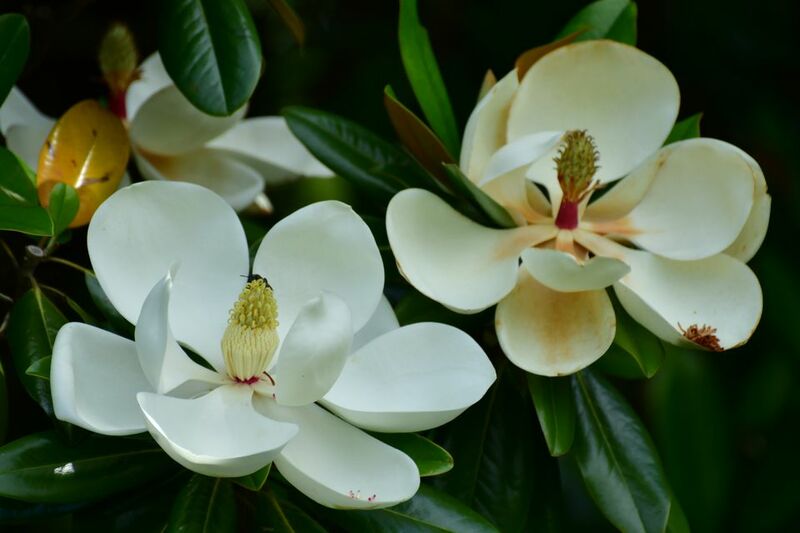 Popular in the American Southeast, to which region these plants are indigenous, Southern magnolia trees are best grown in USDA plant hardiness zones 7 through 9. Grow them in full sun to partial shade. Since they like fertile soil, ideal growing conditions would include a soil enriched with compost. They like a soil pH that is on the acidic side. These trees are classified as broadleaf evergreens. They can grow to be as high as 80 feet tall. The fragrant flowers are white. Bloom time is late spring. Even the cone-like structure left over after flowering is attractive; it can be as much as 5 inches long. If you live in the North and wish to grow a Southern magnolia, look for 'Bracken’s Brown Beauty,' a cold-hardy cultivar, which is suitable for all the way up to zone 5b.